Dr Klaus Schormann, President of the Union Internationale de Pentathlon Moderne, has issued his 2019 new year’s address. 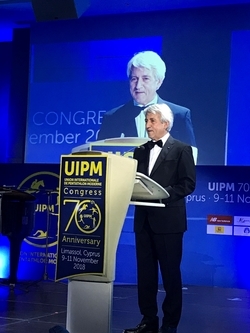 As the global pentathlon community embarks on the third year of the Tokyo 2020 Olympic cycle, the leader of the governing International Federation has pinpointed the key priorities for UIPM Sports and the wider Olympic movement in a wide-ranging address. The 2019 season promises to be one of the most exciting years in the long history of the Modern Pentathlon. This sport was established especially for the Olympic Summer Games; it has been a core part of the Olympic programme since Stockholm 1912, and since 1948 our Union has worked to align sport development to the philosophy and heritage of our founder, Baron Pierre de Coubertin. I can state without fear of contradiction that if he were alive today, the Baron would be proud of the way our movement provides opportunities for sport while promoting Olympic values such as education, peace and tolerance. Where the modern world is split along political, religious and socio-economic divides, the Modern Pentathlon brings people together, using sport as a force for unity. As a former teacher, I am especially proud of how education has come to form a central pillar of UIPM. Sport teaches discipline and respect, both for oneself and others, and it promotes teamwork. For most of its existence the Pentathlon has been a team sport, even at the Olympic Games, but now the Mixed Relay has become a signature of our multi-sport movement. It is the embodiment of gender balance and a key component of the IOC Olympic Agenda 2020. On September 9, 2018, during the Mixed Relay at the UIPM Pentathlon World Championships in Mexico City, we celebrated the 1st Pierre de Coubertin Pentathlon Day. This was a landmark occasion that will be repeated during the UIPM 2019 Pentathlon and Laser Run World Championships in Budapest (HUN), a unique event that will combine our core Olympic sport and our most popular development sport for the first time. More and more people around now the world now have a pathway to pentathlon thanks to the accessibility of our development sports and the appeal of urban, beach and university formats. We are attracting new audiences to our sport and especially younger generations, with more ways to follow our athletes on television and digital channels. In everything we do, our global community of volunteers and professionals work hard to preserve the legacy created by Coubertin. We are also guided by the IOC Olympic Agenda 2020, which promotes the importance of gender equality, inclusion and accessibility, sustainability and many other important facets which are now embedded into our sport at all levels. I wish each of you a happy new year and hope that your sporting endeavours will bring you success, happiness and good fortune throughout 2019.